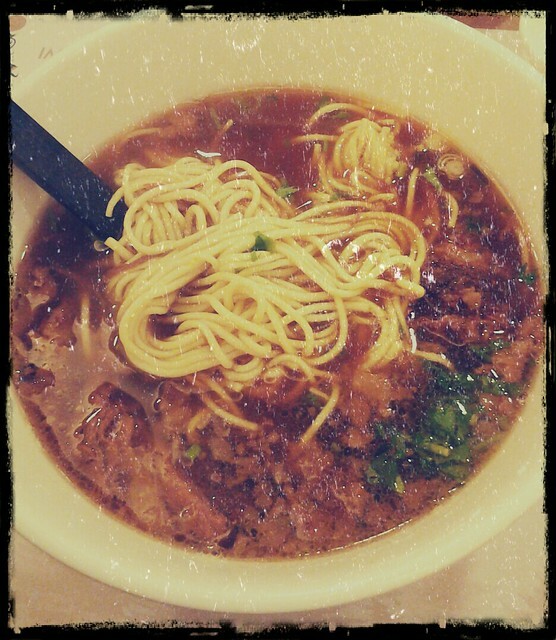 So this is the last post on La Mian World. Maybe. It has been a great journey. 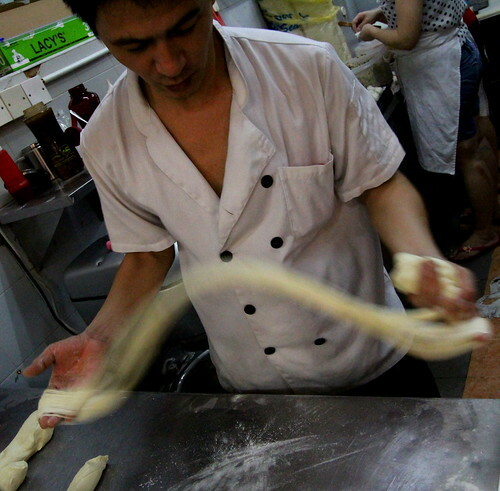 The world’s first blog dedicated to the art of hand pulled Chinese noodles was launched in 2011. With one post per month and fabulous finds of places, restaurants and noodle artists it is the ultimate source of wisdom for all la mian lovers. So or in similar ways goes the usual praise for ones own blog. Anyway I just had a good time exploring different aspects of the La Mian World, Asian food and countries, taking photographs and last but not least eating and enjoying heaps of amazing, fresh hand pulled la mian. I hope you enjoyed it as well. Thanks for reading and keep on eating la mian at your local la mian chef’s joint! And of course you can come back and re-read some old post every now and then. It doesn’t hurt. You should always have ambitious targets in life. My latest target is to try all the Chinese hand-made noodle varieties that I found out about. I stumbled upon a cooking class in Beijing which offers to teach you how to do a whole lot of different noodles from the provinces of Shanxi and Shaanxi. Some of them I had never heard about. So now I am out for the hunt to try them out. 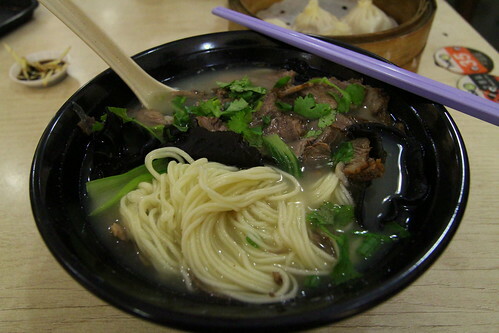 Knife cut noodles dao xiao mian – found it here and there, delicious! 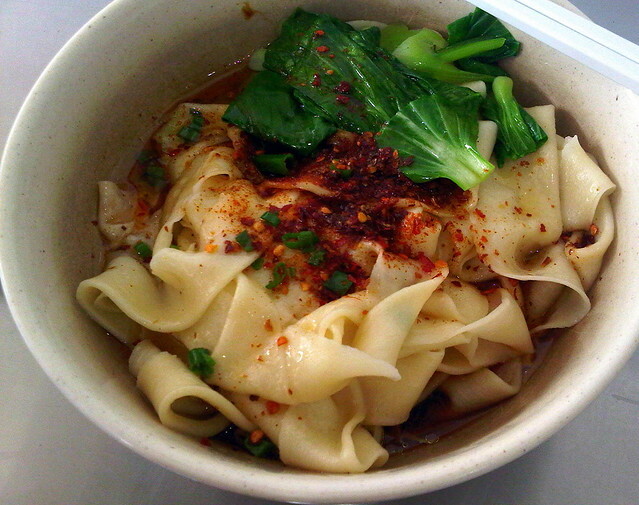 Hand pulled noodles la mian – of course, the queen of hand made noodles, my favorite of 2011 and of 2012. Of course there are sub-varieties of the actual La Mian from super thin angel hair to triangular, round and fat to flat La Mian. In Singapore you can try those at Crystal Jade La Mian Xiao Long Bao outlets. 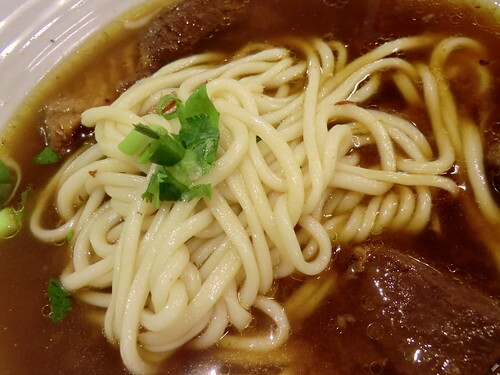 Shaanxi chewy belt noodles shaanxi you po che mian – this is very nice and chewy! Only how will I find all the other different shapes? The courageous Swiss races down the steep asphalt alley with his city-bike. I am impressed with the bar tender’s pisco sour in the Grande Bar and the fact that every city shines magically on a sunny day. The glittering rays of light on the surface of the lake. Friends having a sun-downer in a classic wooden motor boat. The mountain peaks covered in some left over ice and the hills close by in the evening light: Zürich. What connects Japan and Switzerland is the tolerance of their inhabitants for noisy train tracks leading through their living rooms. Berlin feels familiar and far away at the same time. Disgusting, sometimes without soul and then again full of magic and miraculously pretty. At night still creepy Reichshauptstadt. During the day surreal memories of the capital of the GDR at the abandoned orphan’s home in the rain. The English library in dark wood in the luxury apartment of the friend in Hamburg. Champagne in the back yard while the blackbirds sing a spring song about the absent summer. A travel through time and three cities. Europe untangles the Ramen for me. Change is slow and sometimes invisible. Back in the Far East things are different. Change is fast and invisible too sometimes due to its speed. The four seasons don’t exist close to the equator. You can eat them now at Keisuke Tonkotsu Four Seasons at Bugis Village in Singapore. Four distinct styles: spring, summer, autumn and winter, but I still prefer the tonkotsu pork broth Ramen. If you think of Asian mega cities what comes to your mind? Buzzing markets, hordes of people crowding the streets, unbelievable traffic jams and a city life that never stops, twenty four hours around the clock? This might be true for some places or some areas of these Asian megalopolises. However, take a closer look. 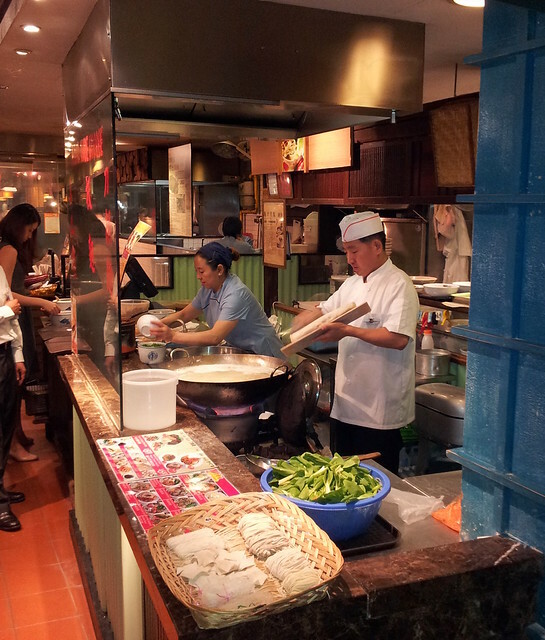 Although many cities boast some more or less famous night markets with rows of exotic food stalls, meal times for many are actually early. In Singapore restaurants are jam packed between six and eight in the evening. Finding restaurants that still serve dinner after ten p.m. can be a challenge. But here comes Swee Choon Dim Sum Restaurant to your rescue. It opens from six to six. That is in six in the evening to six in the morning. So, whether you come at your regular dinner time, whatever that might mean in your cultural environment or after a night out, they will be there for you. Swee Choon Dim Sum in the new trend area of Jalan Besar serves excellent dumplings of all sorts and of course boasts a La Mian chef pulling away the dough during the night. This place is as good for food as for people watching at the wee hours. After night comes day. Thanks to one reader of this blog I could see light in the La Mian scene in Singapore after heading all the way West to Clementi. Just behind the usual over-air-conditioned shopping center is the HDB lined food court, wet market and community shopping area. Most likely I am lacking some language skills here but why you would call a food court Bgain 442 Eating House does not become very clear to me. Maybe Bgain is short for bargain? In any case the Xinpeng La Mian Xiao Long Bao stall must be considered famous in Singaporean terms since it for sure had the longest queues to be seen around there. I can confirm that it is worth waiting in line. 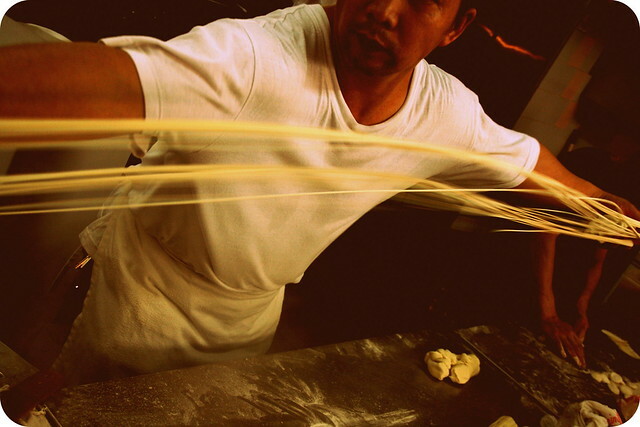 The expertly stretched La Mian are spaghetti thin and have excellent al dente consistence and taste! It seems that La Mian has peaked in Singapore. Anyway an endangered species in China where it originates from, it looks like that it is going downhill with the art of hand-made noodle pulling in the Lion City. The still beloved Noodle Star opened several outlets during the past year but soon stopped having a life La Mian chef in its Jalan Sultan restaurant and never had one in the Bugis one. Imperial Treasure La Mian Xiao Long Bao in Marina Square seems to have closed for good and so does Crystal Jade in Suntec City. Now we all know that the Pearl Center is marked to be torn down this August. This will see another two La Mian stalls go. La Mian World needs YOU to support your local noodle chef! 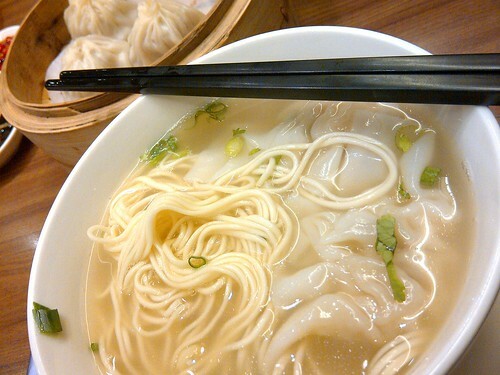 Go out and visit a La Mian Restaurant today wherever you live. Maybe try the ever popular Ju Hao in Lavender Food Square or hop over to Jakarta to try Imperial Treasure’s La Mian Xiao Long Bao restaurant there. It is located in one of Jakarta’s most glitzy shopping malls, the Plaza Indonesia. It looks and feels almost like in a Singapore shopping center with only a bit more traffic to get there. So this is something new to me: the single strand noodle or Yi Gen Mian. Wandering around one of Singapore’s endless shopping malls (which sometimes have as many floors underground as they have above plus several roof top areas) I stopped in awe when I saw this young man pulling what seemed to be an endless string of noodles. According to the menu of the Din Gi Noodle House, which features this open kichen concept, Yi Gen Mian originate from Shanxi province in central China. Shanxi together with neighboring Shaanxi (yes, there is one more “a”) are both famous for its noodle making and noodle dishes (in both cases with two “o”). It is quite an impressive process to produce this longest of long noodles. 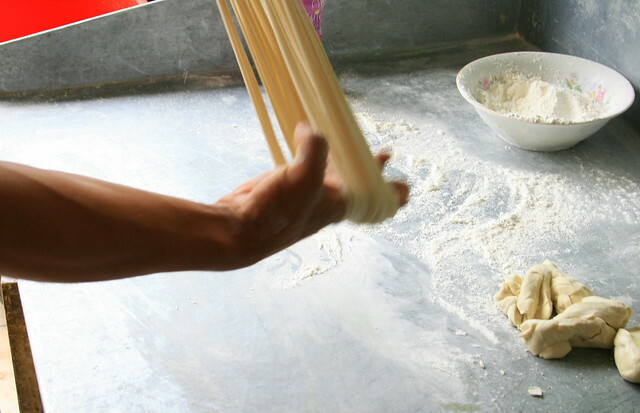 First, one chef rolls long half finger thick strands of noodles and lays them out in a spiral in a metal bowl. 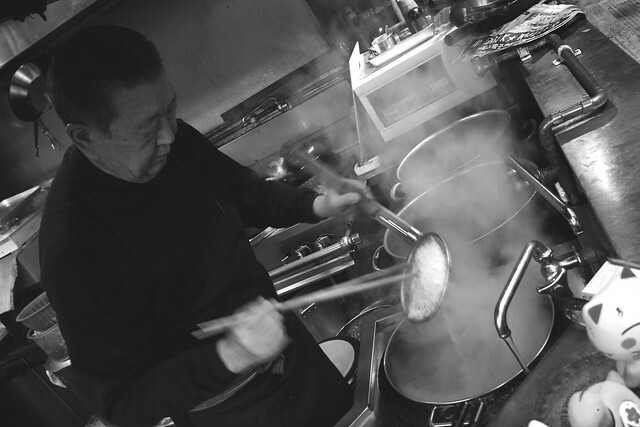 When patrons order their noodles the Yi Gen Mian chef starts pulling this spiral into thick spaghettis and placing it into the boiling water. 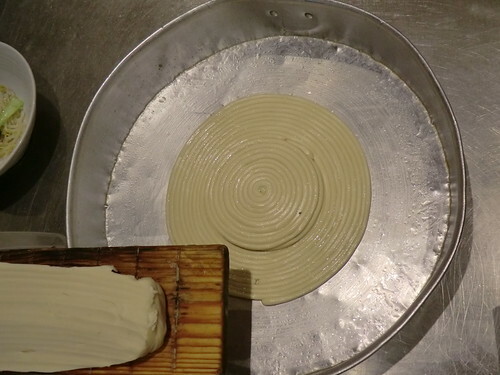 The dough seems to be of a different consistence from La Mian since they will boil in the water seemingly longer. However, in essence they also tasted a lot softer than my favorite al dente made classic La Mian. Maybe some shorter cooking process next time, dear Yi Gen Mian chef? Unfortunately there is not much to be found out about Yi Gen Mian in the internet in any language that I am capabale of understanding. Yi Gen Mian however, are not to be confused with Yi Mian or Ee-fu Mian which originate from the south of China and are made with eggs instead of only flour and water. They are referred to as longevity noodles. 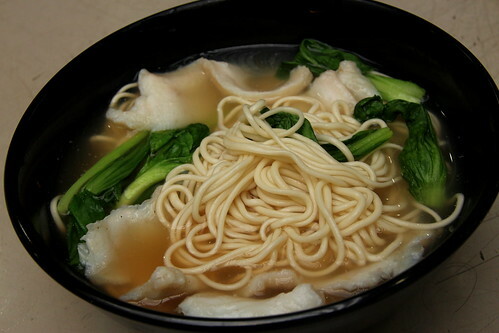 Due to its length the Yi Gen Mian would also make a lot of sense to be considered longevity noodles. I shall have them as my birthday meal next time in any case! Sapporo in Winter! We all know Sapporo had hosted the winter Olympics of 1972 and so you would expect some snow. And snow I got when I visited Hokkaido’s major metropolis this February exactly 41 years after this historic event which marked the first time any winter Olympics were happening outside of Europe and North America. 1972 is an auspicious year for me. This Chinese year of the rat is my year of birth and the (unfortunately overshadowed) summer Olympic games took place in the city where I was born, Munich. I immediately felt at home in the snow covered Sapporo. 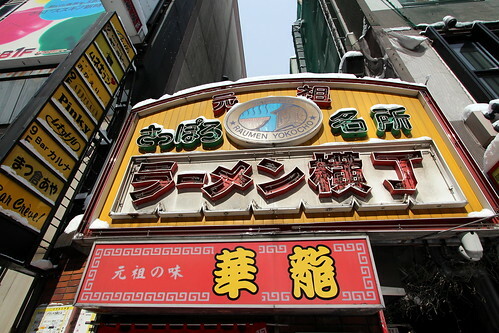 What I did not know, and only found out while warming up in my hotel room from the snow blast outside, is that Sapporo has a so called Ramen alley in its entertainment district of Susukino. Since this year was not the first harsh winter that Sapporoans have experienced, they were smart enough to dig a lot of tunnels underneath the city. So you can practically walk all the way from the main JR railway station to Susukino underground. It is nice and warm and of course features a multitude of shops along the way. Resurfacing at Susukino subway station it is just a short slide on icy roads to the original Ramen alley. 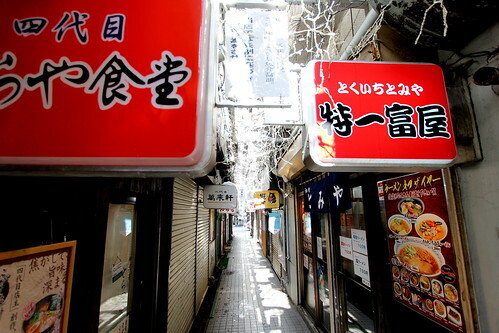 The alley is more like a small passage way between two high rise blocks which is plastered with a long row of small Ramen restaurants. At eleven in the morning most of the eateries were still closed. 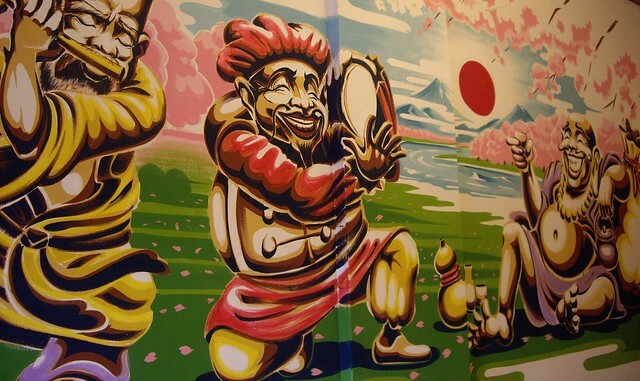 I imagined that in the evening you will be pushed through this Ramen tunnel as two man can hardly pass here. Entering one of the restaurants my lovely travel companion and I were obviously the first guests of the day. The open kitchen of this place showcased a massive mess and was in fact not the usual Japanese eyecandy. However, the old man in the kitchen prepared our meal in his lifelong routine way. He produced a beautiful bowl of Ramen and lit a cigarette after his five minutes of hard work while we slurped the noodles as loud as possible to show our appreciation. 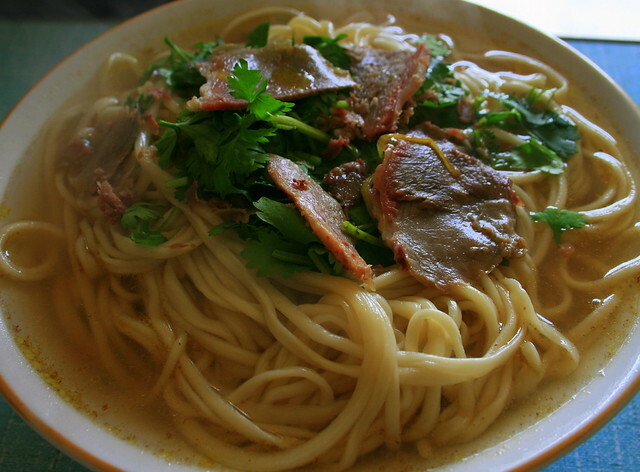 This is the quest for the perfect La Mian handpulled noodle soup around the globe. You are invited to join me, give hints and directions and comment on the absolute uselessness of this endeavour.